This is the sermon I preached on January 15, 2017 at First Presbyterian Church in Red Wing, MN. The text is Luke 4: 14-30. This was my first sermon in this new call. Last week at the end of the service we invited you to take a star with a word on it. A word that you were asked to reflect on for the coming year. We want you to place this star somewhere you will see it, whether that’s the refrigerator, your car, your mirror, as a book mark,…somewhere you will see it. Currently my star is sitting on my desk next to my computer, where I am, a lot of the time. The word I received is “readiness”. I thought, “what am I going to do with that?” Then I read this week’s scripture. I hope and pray that this sermon ends differently than it did for Jesus. I hope you don’t get up and drive me out of town, leading me to the top of Barn Bluff ready to toss me into the river. We really like it here. Also, our old cat, Joe might not be able to take another move. For me this word readiness, fits right into today’s passage from the Gospel of Luke. Jesus, having been baptized is sent unceremoniously into the wilderness where is tempted and then returns to the region called Galilee, to Nazareth, his home town. He goes to the synagogue, as was his custom, and he reads a familiar passage from the prophet Isaiah. Then Jesus gives them a word that they are not ready or willing to hear. In the retelling of those stories, Jesus is reminding the gathered, the in crowd, the haves, that God has and will always be on the side of the least of these. On this weekend in our national calendar, this story of Jesus bringing a hard word to the in crowd seems appropriate. Jesus’s readiness to deliver a message that he knew wouldn’t sit well with the crowd, but needed to be said is apparent. Martin Luther King, Jr. was known for saying some hard words, that he knew wouldn’t sit well but needed to be said, too. On this, our national holiday celebrating his life we remember the beautiful, soaring, and inspiring words of his “I have a dream” speech, we remember the hopeful words delivered in Oslo, Norway during his acceptance of the Nobel Peace Prize. Martin Luther King, Jr. has become a sort of talisman whenever we want to talk about equality, he is remembered as this sweet, loving, kind pastor who everyone liked. But as a student of history I know that this was not the case. It seems that at times we have not been ready to hear the Good News in Dr. King’s message but we have chosen only to hear the nice news. This week I was reminded of the words from his famous Letter from a Birmingham Jail. These are words, I do not like, I do not find comfort in them, they are not inspiring. They are convicting, they are real, they are most certainly GOOD NEWS. Every time I read this letter, I am pulled up short here. I have yet to be ready to hear these words. I feel like, I am a person of good will, it seems that you are all people of good will. The people in the crowd that Jesus was talking to were people of good will. It seems as if the people of Nazareth were people of good will but they weren’t ready. They weren’t ready for the not so nice, Good News, that Jesus was proclaiming. They weren’t ready to hear that they didn’t get any special treatment from God or Jesus because they were the children of Abraham or from his hometown. The Good News, but not nice news, is and was that the “year of the Lord’s favor” was for all, Jews and Gentiles alike. The Good and nice News is that God loves you, just as you are, no strings attached. The Good and not so nice news is, that love extends to those outside the in crowd, those people you might not like very much. The people in Nazareth got angry, got violent, because Jesus told them something that they were not ready to hear, that the God’s love wasn’t only for them, God’s justice wasn’t only for them, God’s love was for the poor, the captive, the blind, the oppressed, the immigrant, the Jew, the Muslim, the unbelievers, those in the LGBTQ community, those of all races, those people whom we might find to be unforgivable. God’s love extends to all. This is the Good News of the Gospel. May we be ready not only to hear the Good News, but let us be ready to live the Good News, even if it isn’t nice news. This sermon was preached at First Presbyterian Church in Nebraska City, NE on November 13, 2016. The sermon text was Isaiah 6: 1-8. Audio from the sermon can be found here. Over the last year and a half, we have been using something called the Narrative Lectionary, it’s a system that selects the readings for us, attempting to walk us through the broad story of scripture from Genesis to Revelation. Today’s reading comes from the sixth chapter of Isaiah. As Rev. Marci Glass says, “Biblical scholars love verses like that because dating a biblical text is so difficult. But King Uzziah! We know that. He died in 742 BCE. King Uzziah had reigned for five decades in relative peace and stability. King Uzziah died as Assyria, whose capital was Nineveh, Assyria which was a vast military power in the area was coming closer and closer to Jerusalem. It would be just another 16 years before the Northern Kingdom of Israel would fall to Assyria. So the year that King Uzziah died was an uncertain time for the people of Israel, there was a lot of anxiety in the country about what their future might be. Isaiah goes to the temple, this house that Solomon built, a holy place where God is and he has this vision. He sees God sitting on a throne so high and lofty, so large, that it is only a bit of the hem of God’s robe that fills the vast temple where Isaiah is standing. There are six-winged seraphs shouting, not of God’s might, but of God’s holiness. They are praising God so loudly that this magnificent building begins to shake. As soon as he sees God’s holiness, his own sinfulness becomes apparent to him. This is actually why our worship services are structured the way they are to this day. We begin with a call to worship and a song that gives praise to God. And John Calvin believed that as soon as you praise God’s goodness, you can’t help but recognize your own lack of the very same qualities. And so it is appropriate to go immediately to confession and then an assurance of your forgiveness. Before we can become who we want to be in Christ, we must first be humbled to recognize how far we have to go. Isaiah had a good track record before this, he had a faithful life up until this point. Just as each of you has led a good life, you have helped others along the way. But all of us, when in the presence of holiness, know that we have fallen short of the glory of God. Rev. Glass suggests, “The point is that in the middle of a particular moment in human history, Isaiah finds himself transported into the presence of God. There was a particular moment in Isaiah’s faith journey when he needed God in a new or different way. And I could give you a whole sermon on Assyria, Babylon, exile, and what was happening for Isaiah. Over the last two weeks, the news that is both exciting, nerve wracking, and sad is that my wife and I have been called to a new congregation. Which means that now we are beginning a transition process. Yesterday, members of the session met with our Committee on Ministry liaison to start to talk about the process for which you will undertake in the coming months. The session will have many decisions to make and I trust that they will make them prayerfully and faithfully. Also, you as a congregation will have many decisions to make and I trust that you will make them through prayer and discernment. Even each of you individually will need to make decisions. I know that God will be with you throughout this process. God is near. The whole earth is full of God’s glory. Once Isaiah recognized his own sinfulness, a live coal that had been taken from the altar was touched to his lips and he was told that his sins were blotted out and that his guilt had departed. And immediately he heard the voice of the LORD saying “Whom shall I send and who shall go for us?” and Isaiah replied “Here I am, send me!” He didn’t yet know to what. But he had been called in the fire of the coal, just as we are called in baptism. In baptism, we die to ourselves so that we can rise with Christ, living for Jesus in a world that needs to hear his message. God is here. God has promised and God has come. You are the message bearers in this time to that reality. The world needs to know of God’s holiness, of Jesus’ compassion, of the comfort of the Holy Spirit. Like Isaiah, we come for God in the sanctuary, we take God with us. Here am I, send me. This sermon was preached at First Presbyterian Church in Nebraska City, NE on October 23, 2017. The text was 2 Samuel 7:1-17. Audio of the sermon can be found here. We’ve come a long way since last week. Last week we talked Hannah and her giving over of her son Samuel to God, to be raised by Eli as a nazirite. Since that reading, Samuel grew up, he responded to God’s call by saying “Here I am, Lord” and became the prophet of Israel. The Israelites became convinced that they wanted, that they need a king. To quote Baptist blogger Chuck Hooten, “Israel wanted a king. For years God had acted as their provider, protector, and sovereign but in the face of mounting pressure from rival nations and the innate human desire to look and sound like everyone around them Israel wanted a change. They wanted a king that was made of flesh and blood. The prophet Samuel begged them to reconsider. He told them that a king would tax them, oppress them, force them to work for his pleasure, and take their sons off to war. The people were unswayed. It was a king of flesh that they wanted and so it was a king of flesh that God would provide. David sits down, all the enemies are defeated, he has a moment to rest, probably one of the first moments since he was a boy. He surveys home, his kingdom, and he reflects on his life. He decides that God wants, God needs the same things that he needs or wants. He decides that he will build God a house of cedar. In short, God tells David, thanks but I got this. You do your job and I’ll do mine. It reminded me of playing football. Each person on the team has a role, quarterback, wide receivers, linemen, running backs, linebackers, defensive backs, coaches, trainers, equipment managers, cheerleaders, on and on. They all have a role, and the teams that do have players that focus on their role, they don’t try to do too much, they do their job and they do it well. This also works in the communities, in companies, on farms, in churches, even in households. When everyone knows their role, and when others are willing to support them in that role, the whole house, church, farm, company, or community benefits. I have a role here at First Presbyterian Church, our session has a role, our deacons have a role, our Presbyterian Women have a role, our Sunday School teachers have a role, each and every one of you has a role to play in our vision of Planting Seeds of God’s Light here in Nebraska City and throughout the world. For some this role is performed outside the walls of this church. I asked in a recent Builder article for you to start to think about where you volunteer your time, where to donate money, where do you serve? In your bulletins there is a slip of paper for you to start to thinking about that and write it down. In a few minutes during the offering I would like you to place it in the offering plate so we can compile of a list of all the places that First Presbyterian is working. My guess is that some of you, do too much, some of you do too much not because you are greedy or controlling, but because you care, because you want to give back to God and to the community that raised you, that has done so much for you. This is not a bad thing, but it might also not be a good thing. David was reminded of his role, he was reminded that is wasn’t his job to build a house for God, that God was, is, and will always be in charge. God had tapped someone else for that job. God promises David that he will never let him or his household go. This is the beginning of the Davidic line that leads straight to Jesus. There are ups and down, valleys and mountaintops, righteous and wicked players, but God never forgets God’s promise to David. God will not, has not, forgotten his promise to us. We have been here for almost exactly 161 years, we have had 30 pastors, we have had over a 1,000 members. Currently our doors are open and our facilities are used by groups from around the community. Last week alone, we hosted two funerals that were attended by so many people we had to open up the wall. We have members on just about every board in the city, we have members who volunteer their time, energy, intelligence, and love for organizations on the local, state, and national level. We have members who do things for others, in the name of God, that we will never hear about or never see. God is abounding in steadfast love here. It’s not always pretty, it’s not always a mountaintop, but even in the valleys we have seen that God is with us. Now for us, we have discerned that our job our role as a church here in Nebraska City is to Plant Seeds of God’s Light. Let us remember is not our role to save the world, or solve all of its ills, it is not our role to do everything or be all things to all people. Our role, to quote borrow from Rev. Dr. Joel Lundak, is to plant as many seeds as we can, for as many people as we can, for as long as we can. We might not get to see the fruits of our labor and we may never get to know if the harvest was good, but we do know that God is faithful and that, like David, God will never take away God’s steadfast love from us. This sermon was preached at First Presbyterian Church in Nebraska City, NE on November 6, 2017. The sermon text was Jonah 1:1-17; 3:1-10, 4:1-11. Audio from the sermon can be heard here. This morning I want us to take a look at a story that many of us have heard since we were kids. Today, however, we are going to take a look at the Jonah story with fresh eyes and like many of the stories of the Bible we will see that it’s not really a children’s story about a man in a big fish. It’s a story about the grace and justice of God. It’s a story that stretches our understanding of the width, breadth, and depth of God’s love. It broadens by a mile our original definitions of justice and mercy. We imagine a merciful God but then God shows greater breadth to that mercy that we could have imagined, and then a justice that is broader still. Now that we have a little context, let’s dive in. 7 The sailors[a] said to one another, “Come, let us cast lots, so that we may know on whose account this calamity has come upon us.” So they cast lots, and the lot fell on Jonah. 8 Then they said to him, “Tell us why this calamity has come upon us. What is your occupation? Where do you come from? What is your country? And of what people are you?” 9 “I am a Hebrew,” he replied. “I worship the Lord, the God of heaven, who made the sea and the dry land.” 10 Then the men were even more afraid, and said to him, “What is this that you have done!” For the men knew that he was fleeing from the presence of the Lord, because he had told them so. 11 Then they said to him, “What shall we do to you, that the sea may quiet down for us?” For the sea was growing more and more tempestuous. 12 He said to them, “Pick me up and throw me into the sea; then the sea will quiet down for you; for I know it is because of me that this great storm has come upon you.”13 Nevertheless the men rowed hard to bring the ship back to land, but they could not, for the sea grew more and more stormy against them. 14 Then they cried out to the Lord, “Please, O Lord, we pray, do not let us perish on account of this man’s life. Do not make us guilty of innocent blood; for you, O Lord, have done as it pleased you.” 15 So they picked Jonah up and threw him into the sea; and the sea ceased from its raging. 16 Then the men feared the Lord even more, and they offered a sacrifice to the Lord and made vows. 17 [b] But the Lord provided a large fish to swallow up Jonah; and Jonah was in the belly of the fish three days and three nights. The title of this section of Jonah is “Jonah Tries to Run Away from God”. How does that work out for anybody in the Bible or now? Jonah is told to go to Nineveh and he doesn’t want to. So he flees. The more you learn about Nineveh, the more you understand where Jonah is coming from. Nineveh is the capital city of the Assyrians. The Assyrians were a violent people who regularly killed Israelites. In fact, it would be the Assyrians who would come and destroy the northern kingdom is Israel. These are truly enemies for Jonah. One commentator suggested that this would be similar to God asking a Jew to go, preach to a guard at a concentration camp in Nazi Germany. No wonder he doesn’t want to go give them God’s message. This story reminds us to be wary of any faith that tries to narrowly define who is in and who is out of God’s kingdom. It reminds us that God repeatedly tells us to welcome the foreigner, the stranger, that we ultimately are Gentiles grafted into the vine of God’s kingdom. And of course, it begs the question: Who is your Nineveh, the people you really don’t want to believe could be part of God’s salvation plan? In this week of the election, is your Nineveh Democrats or Republicans? Is it immigrants? It is Muslims? Who is your enemy? The Feasting on the Word commentary says, If God intends real salvation for all the peoples, then in all seriousness, we must at least talk to our enemies …… In this deadly serious mess, the only way to avert total catastrophe is to talk. What an appropriate message during this week of the election when the rhetoric on both sides has become so divisive, and it seems that people can’t even comprehend talking to someone on the other side. The only way to avert total catastrophe is to talk to one another. But all of this is centered on us. How do we respond to God’s call, how are we like Jonah? What if we read the Jonah story and asked a different question? What does this story tell us about God? What about God is revealed to us in this story? The first thing revealed about God’s nature in Jonah is that God calls us to surprising, even ridiculous things. What is the most shocking, ridiculous thing you can think God might call you to? That’s what is happening in this story. God doesn’t always work in clear, straight paths that make sense. Sometimes God works in astounding, confounding ways. And sometimes God call us to join him in these surprising things. I know that we are skipping the time that Jonah spent in the big fish, which is the part that we focus on most of the time. Some have said that it seems implausible that a big fish would swallow a human whole and then spit them out on the beach three days later, often the image of a whale is used, like Pinocchio we think of Jonah with a candle sitting in the belly of the whale. One commentator said that the idea of Jonah spending three days in a whale and coming out unscathed is more believable than what happened when he reached Nineveh. Can you imagine all those cows and horses in sackcloth? What I wouldn’t give for a Polaroid of the whole city, including the animals covered in sackcloth. I read this week that Jonah is considered the most proficient of all the prophets. He speaks a total of 8 words and the whole city repents. No other prophet can say that. For a second time, God gives Jonah the message. The second thing we can say about what we learn about God is that God journeys with us, even in our stubborn rebellion. When we try to run, God is there. When we are in the pits of despair, God is there. When we come to our senses and return to God, God is there. God journeys with us, no matter where we are or how much we are currently rebelling against God. We finally hear from Jonah why he fled to begin with. Because he knew that God is gracious and merciful, slow to anger and abounding in steadfast love. And Jonah didn’t want any part of that if it was extended to his enemies. Here is what we learn about God. God’s love is extraordinary. God’s grace is for all. In this story, the just thing would be for Nineveh to suffer. They had caused and would in the future cause so much suffering for Jonah’s people. God is asking for the right to love our enemies regardless of the consequences. When God’s grace and God’s justice come into conflict, grace wins. Love wins. Sometimes that means that we are going to get burned, we are not going to get the justice we want. The God who calls us into surprising adventures, who journeys with us even as we rebel, who chooses to extend love and salvation to all people, that God whom we worship and serve has chosen grace – for us and for all, our friends and our enemies. This is the good news that we proclaim. This sermon was preached on November 20, 2016 at First Presbyterian Church in Nebraska City, NE. The sermon text was Jeremiah 36: 1-8, 21-23, 27-28 then 31: 31-34. Audio for the sermon can be found here. Last week we read the calling of the prophet Isaiah, this week we flash forward about 200 years to the reign of Jehoiakim, near the end of the career of the prophet Jeremiah. Last week, Israel was facing destruction by the Assyrians, yet now it is the Babylonians who have conquered and begun to send the nations of Israel and Judah into exile. Jeremiah has been rather unpopular in his homeland. As the Babylonians begin to take over, Jeremiah calls upon the Judeans to submit, this is the consequence of the unfaithfulness of God’s people. Their lives and history will be forever changed. Jeremiah acts out the destruction of the kingdom and for his trouble he is confined to the palace, a prison of sorts. He can no longer go to the temple; he can no longer be with the people. So here we are in Chapter 36. Jeremiah is instructed to write down all the words that the Lord has revealed to him. Jeremiah dictated the Lord’s words to Baruch, Baruch then read them to the people, then placed them in a room, Jehoiakim sends Jehudi to retrieve the scrolls. As Jehudi read the scroll, little by little the king rips it a part and throws it in the fire. Rev. Mary Austin says, “Curiously, the king doesn’t have the whole scroll burned immediately. He listens to each section, and throws it into the fire, as if caught between wanting to hear that God and the prophet have to say, and wanting to stop up his ears and ignore the whole thing. We can’t tell if he just wants to hear what the people have already heard, or if he’s interested in what God has to say. We don’t know if he’s burning the sections as a sign of defiance, or in despair that he won’t be able to comply with what God is saying. He is caught between what is and what should be. I sort of understand where Jehoiakim is coming from. Have you ever received a performance review that you didn’t agree with. I have you ever been scolded, especially in adulthood, by someone and taken it well. We, I, get defensive. We lash out, we crumble up the paper and throw it out the window, we tear it up and burn it, we quit our job, we quit our church, we break our relationship, we refuse to listen, we lash out. This happens all the time, we see it on social media, we see it in regular media, we see it from friends, family, we see it from our politicians, our police, our military, our pastors, our members, our kids. How many times in your life have you looked back and realized that the person who corrected you, who called you out, who spoke prophetically to you was right? For me it’s innumerable. My camp director who told me I was a born leader but that I ran right up to the line of appropriate and stopped and the people I was leading didn’t know where the line was and regularly ran past it. My CPE supervisor, who told me that I was a fundamentalist. My Committee on Preparation for Ministry that told me I wasn’t ready to be ordained, that I would have to do a few more steps. I was so angry, sometimes I’m still angry. I wanted to cuss all of them out, I wanted to walk away, I wanted to quit, I wanted to tear up their words and burn them. The thing is, they were all right. They helped me see my own sins and shortcomings and make changes. Some days, those changes are visible, some days they are they aren’t. I try to do my best every day. Jehoiakim, didn’t have to listen, he was the king after all. Well at least that’s what he thinks. Let’s read a little more of Chapter 36 starting with verse 30. This shows us that God’s word is more powerful and lasting than the actions of a narcissistic king. This is what happens when people in power, when we don’t heed the prophetic words of God. When we dismiss pain, when we dismiss fear, when we dismiss people because they don’t look, sound, or worship like us. This is what happens when we forget that it is Jesus Christ who is king and we are not citizens of this world, we are citizens of the Kingdom of God. We are aliens in a foreign land, and regardless of ruler, senator, representative, or president, it is Christ who is King of our land and our hearts. Today is Christ the King Sunday, the Sunday before the beginning the season of preparation of expectation we call Advent that we celebrate with the birth of our savior, the in breaking of the God with us, Emmanuel, the reminder that it even in the darkest night, the light of Christ shines in the darkness and nothing can overcome it. We remember that Christ, our king, came in the form of a helpless baby, grew up and taught us to love God with everything we have, and love our neighbor as ourselves, He taught us to care for the least of these, he taught us to love each other as he loved us. The Apostle Paul, in the second chapter of the book of Ephesians, reminds of that Christ came to break down the dividing wall that is built between us. Christ who reminds us that God is with us. The prophet Jeremiah tells us in chapter 31. * Inclusive, not divisive (Jeremiah 31:31) — It includes both the northern and southern kingdoms. This is a remarkable break from the tensions and outright animosity between the two kingdoms, which continued through the life of Christ (John 4:4-26); the participants explicitly include the “least to the greatest” (Jeremiah 31:34). * Lawful, not lawless (Jeremiah 31:33) — The new covenant will build on the Torah of God. Now, the people have a new strategy for staying faithful to God. Pursuant to the Jeremiah 36 episode, it will center on the written word. It is better to think of a Torah in the sense of God’s “teaching,” rather than New Testament constructs of Torah as legalism. Torah was an expression of how the community could maintain covenantal fidelity. * Relational, not distant (Jeremiah 31:34) — The earlier covenant was intimate in that it involved a God who “takes by the hand” and the metaphor of marriage. The new covenant incorporates these features in that they will fully know the Lord in both intellectual acknowledgement, but also inclusive in the intimate ideals that they will know the Lord and be known by Him. Most significantly, the new covenant is indeed new! The cloud of sin no longer hangs above the community. For God declares, “For I will forgive their iniquity, and remember their sin no more.” With the freedom from sin, the people can now move forward in their relationship with God. This new covenant is much more protective and lasting. In the midst of the Babylonian sufferings, it enables the faithful to be grateful to God. Although politically oppressed, with little economic hope and an unknown future, the covenant of God brings rise to thanksgiving to all. As we gather on this Christ the King Sunday, as we remember that the covenant, the knowledge that God has placed on our hearts, let us continue to work so that all feel safe. At school, walking down the street, in the class room, even in the theater, but let us not be so safe that we can not hear when God is speaking truth to us, for often times the Good News is not Nice News. Rev. Mary Austin says, “God promises a new covenant, when fragile, temporary scrolls won’t be needed anymore because God’s law will live in our hearts. We won’t need a book or a tablet or a scroll. We won’t need someone to read it to us, or teach it to us. We won’t need an intermediary. No ruler will be able to do away with God’s word simply by burning it up. It will live fully in our hearts. We haven’t arrived there yet, but God’s promises still stand. In a time when our own country is buffeted by violence in words and actions, when we seem to be overtaken by a spirit of division, God’s word comes back to us through the prophet. The invaders at our gate are the inner armies of hatred and separation, but God’s promises endure for those who are willing to hear, and to live with God’s persistence. Let us have ears to hear and hearts open to repentance as we are called back to be the people of God, the hands and feet of Christ in this foreign land. Amplify. Amplify. Love. Love. Listen. Listen. I am convinced that one of the key roles of the church in our time is helping people to see that there is no separation between the sacred and the secular. That every moment of every day has the potential to be holy and God-filled. 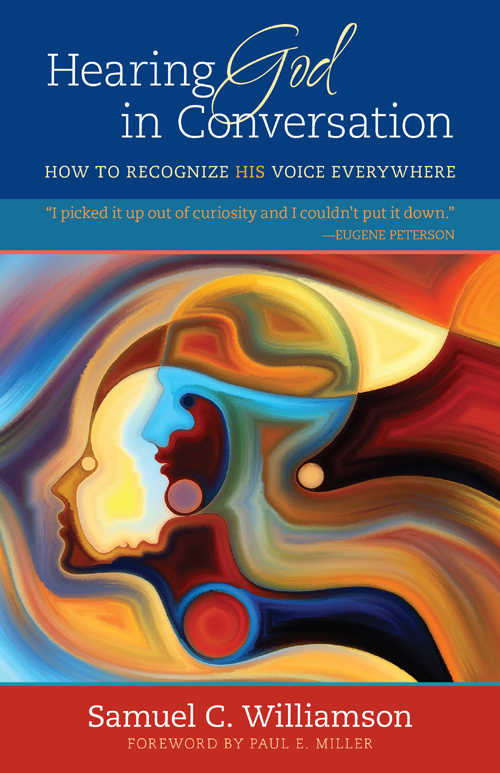 Thus, I was intrigued by the title of the new book “Hearing God in Conversation: How to Recognize His Voice Everywhere”. Overall, I found this book very accessible, written in a style that made the pages go quickly. The author used every day examples that were relatable to my life. As I read through the chapters, the book increased my desire to seek God’s voice in my life. There were a few issues for me with this book, however. The book is written with exclusively male language for God which I find troublesome. I believe the author could have made his point while reaching a broader audience had he used inclusive language. Also, in several chapters the author is discussing ways of encountering God that are long held traditions within the Christian faith such as Lectio Divina and spiritual direction. He writes as if these were new concepts not ancient ones. I am glad I read this book and feel like it helped spur me to seek a deeper conversation with God. Despite my critiques, I would recommend this book to those searching for a more intimate relationship with God.